The Magic Bullet is the original bullet blender from the same brand who makes the NutriBullet blenders. The Magic Bullet came first, and it has stuck around like glue. If you’re wondering if it’s worth your while to go for the OG Magic Bullet or reach for one of the newer bullet models, we are here to help. Here you’ll find a comprehensive, unbiased guide to the Magic Bullet so you can see if it sounds like your cup of tea…or cup of smoothie. What can you do with the Magic Bullet? What does it come with? What do customers love and hate about it? What’s the difference between the Magic Bullet and the NutriBullet range? 1 What Interesting About The Magic Bullet? 2 What’s the difference between Magic Bullet and NutriBullet? 5 What do you get with the Magic Bullet? How big are the cups? 13 What’s The Best Price For The Magic Bullet and where can I buy it? What Interesting About The Magic Bullet? The thing is, the Magic Bullet can do lots of things. But…it doesn’t do them as well as other, more powerful blenders. For example, it can blend hard foods such as ice and hard fruits…but it needs a bit of nudging midway through the process to ensure all the bits are caught by the blades. It can make nut butters, but there are likely to be uncrushed nuts in the mix. The tall cup and short cup are both safe for the microwave, but the party mug isn’t. The flat blade is for grinding hard foods such as coffee beans and spices. The cross blade is for the usual jobs like smoothies and chopping. Not all packages come with the flat blade, you need the 15-piece set to get both blades, otherwise just buy it separately. What’s the difference between Magic Bullet and NutriBullet? The Magic Bullet and the NutriBullet models come from the same company. The Magic Bullet is the original “bullet” from which the NutriBullets came from. There are lots of NutriBullet models (RX, pro, lean etc.) with different features, wattages and accessories. The main difference is that the NutriBullets are all much more powerful than the Magic Bullet. For example, the RX has 1700 watts which seems colossal against the Magic Bullet’s 250 watts. The Magic Bullet has around 3000 reviews on Amazon, with an overall rating of 4 stars out of 5. 62% of the votes are in the 5-star section, 15% are in the 1-star section and 11% in the 4-star section. Small and compact: happy customers have raved about the small, compact nature of the Magic Bullet. They love how it fits into nooks and crannies in the kitchen, without creating annoying bulk. Great for baby food: there are lots of comments in the 5-star sections regarding how well the Magic Bullet makes baby food. This makes sense considering the Magic Bullet is great with soft ingredients such as cooked fruits and veggies. Super easy to use and clean: many positive reviews give a significant mention to how easy the Magic Bullet is to use and to clean. A quick rinse or a trip through the dishwasher is generally all it takes. Leaks: unfortunately, lots of 1-star reviews mention a black liquid leaking into the blender cup from the base. Struggles with ice and harder ingredients: people who didn’t find the MB great for smoothies have mentioned in exasperation that it does not blend fruits or ice properly, leaving chunks and an uneven consistency. Burning smell: ah yes, the old burning smell issue again. Each and every blender I have researched and studied has at least some negative reviews describing a burning smell, and the MB is no exception. Customers have stated their Magic Bullet started to smell like smoke after a couple of uses, and some even burned out all together. Doesn’t work with hot foods: you really shouldn’t put hot foods into any blender, but regardless, there are negative reviews describing explosions of hot liquids. You can, however, use the tall and short cups in the microwave, with the vented lids if you have them, to heat soups and sauces after you blend them cold. Yes, you can. Lots of people use their Magic Bullet to grind coffee beans very successfully. For grinding coffee beans and nuts, use the flat blade not the cross blade. What do you get with the Magic Bullet? How big are the cups? It does depend on which pack you purchase. There are a couple of options, one is an 11-piece option which only includes the cross blade (not the flat blade). There is also a 15-piece pack which has 2 blades, more cups and a range of vented lids. 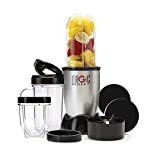 These are the basic items included in all Magic Bullet packs: 200-watt power base, tall cup, short cup, party mug, 2 resealable lids, flip-top lid, 2 lip rings, cross blade. It’s super easy to use. You just pop the ingredients into the cup of your choice, screw the blade onto the cup and screw into the base. Press down on the cup to blend, and release to pulse. If you’re blending smoothies, chopping veggies or herbs then use the cross blade. If you’re grinding dry ingredients such as coffee or spices, use the flat blade. The manual outlines three different Magic Bullet techniques: the pulse, the shake and the tap. Basically, you either press down on the vessel and immediately release to pulse. To “shake”, you literally just shake the vessel to move the contents of the vessel evenly toward the blade. The “tap” is when you take the vessel off the power base and tap in on the counter to dislodge any stuck ingredients. These tips in the manual are helpful, but it’s pretty simple and self-explanatory once you get going. Basically? Pulse, blend and give it a shake or tap if anything gets stuck. Yes, it’s really easy to clean considering the fact you can pop everything except the power base into the dishwasher. Otherwise, just give it a quick scrub with your dish brush and your usual sudsy water. These two differ in many ways, mostly because the Baby Bullet is a very specific model while the Magic Bullet is broader in terms of usage. The Baby Bullet, as you can imagine, is designed for making baby food. There are 3 different blend “stages”; puree for little babies, textured and thicker food for older babies, and larger, harder blends for toddlers. It comes with a whole lot of cute and handy accessories and tools, including a steamer for cooking veggies. You get a power base, two kinds of blades, a blending bowl and a whole lot of storage cups, lids and trays. Well, if you’re looking for something specifically for baby food and you don’t mind having a blender which won’t really serve you for anything else, then the Baby Bullet would be great. However, heaps of people have raved about how awesome the Magic Bullet is for blending baby food. These two are pretty similar in the sense that they are personal bullet blenders with a base, blades and cups. The Bella Rocket Blender is a wee bit cheaper than the Magic Bullet, about $10 cheaper give or take. The Bella Rocket comes with more accessories, including two different kinds of blades and a range of lids for different uses (including a shaker lid for spices). The Bella has a slightly higher wattage at 240, compared to the Magic Bullet’s 200 watts. They both operate without buttons or controls, simply by screwing the cap and blades into the base. If we’re going on overall customer satisfaction then I’d go for the Magic Bullet, as it has a higher rating than the Bella Rocket Blender. They both have roughly the same amount of votes on Amazon and the Magic Bullet comes out with half a star to its advantage. First of all, the Black and Decker PowerCrush Quiet Blender is not a bullet blender, it is a pitcher blender, so that’s a decent difference. It is more expensive than the Magic Bullet (currently about $50 at Walmart). There’s a major difference in wattage; the Black and Decker has 900 watts, compared to the MB’s 200 watts. And of course, the Black and Decker has been designed to be quieter than the average blender. While there aren’t many reviews out there for the Black and Decker PowerCrush Quiet Blender, the ones that are there aren’t so great. There are quite a few comments about “breaking down” and dying after a few uses. The Magic Bullet has a much better track record. The MB is also more compact and has that great bullet blender benefit which allows you to drink your smoothie from the vessel it is made in. Sure, it’s not hard to pour a smoothie from a pitcher into a glass…but it does create more dishes to be washed. The Breville Blend Active is a highly-rated personal bullet blender designed for sports, with a 300-watt base, tritan bottles and sip lids. However, it’s not compatible with US homes, and is made especially for UK homes with a Vac of 240. Unless you’re in the UK, go for the Magic Bullet. It will serve you pretty much exactly as the Breville Blend Active would, but with different cups. Both of these models are bullet blenders with bases, cups and screw-in blades. However, the Cuisinart has manual control buttons, “high”, “pulse” and “low”. The Cuisinart has a higher wattage than the MB, at 350 watts compared to the MB’s 200 watts. The Cuisinart comes with two blades, one for general blending (i.e. smoothies) and a chopper blade for herbs and spices etc. The Cuisinart has more cups than the MB, with a small chopping cup, a large 32-oz blending cup and four 16oz to-go cups with sip lids. The Cuisinart is a wee bit more expensive, by about $20 depending on where and when you buy it. On power, aesthetics and accessories alone, I would probably go for the Cuisinart Compact Blender. However, the Magic Bullet does have a slightly better track record with ratings and reviews. First off, the Farberware 17-piece Blender is not currently available, so keep that in mind. The Farberware is a personal bullet blender with 240 watts, 40 more watts than the Magic Bullet. It comes with a blending blade, a chopping blade and various cups with lids. I would go for the Magic Bullet. The Farberware seems a little unreliable and not very durable, and only has a 3.6-star rating on Amazon (although it does have far fewer reviews). What’s more, the Farberware isn’t currently available and I’m not sure when it will be again, which could make replacement parts difficult to find. The Hamilton Beach Single Serve blender is a personal bullet blender. It has a lower wattage than the Magic Bullet, at 175 watts. One of the other differences between the two is that the Hamilton Beach has a pulse button, which doubles as the power button. The Hamilton Beach Single Serve Blender has thousands of reviews, and an overall rating of 3.8 stars as of now. There are quite a few comments about the blender breaking down, burning out and being all-around slow. Choose the Magic Bullet, it has a higher wattage, sturdier construction and a better track record for strength and durability. The Magic Bullet Mini is basically a tinier version of the original Magic Bullet. It has been designed to be portable and easy to travel with. It comes in a small 6-piece set with a power base, mug, small cup, blade, sealable lid and lip ring. The main difference between the Mini and the original is the size of the base and the cups, and the number of accessories. If you travel a lot, you have a motorhome or you need a little blender to take to and from work then the Mini could be good for you. Otherwise, just go for the original Magic Bullet, you’ll get more use out of it and can make larger batches. First of all, the Ninja Master Prep is a completely different brand, it comes from Ninja. The Ninja Master Prep has been designed for multi-tasking in the kitchen: making smoothies, ice drinks, chopping and dicing veggies. The Master Prep comes with one power base, a 48-oz pitcher and a 16-oz chopper bowl. Another key difference between the two models is that the Master Prep has 450 watts while the MB has 200 watts. Also note that the Master Prep’s power base gets clicked into the blending vessels from the TOP, as opposed to sitting on the bench top with the pitcher on top. This is so the user can have control over the blending by pressing down on the base. The Master Prep blades are long and rod-shaped with blades protruding out the sides, as opposed to the Magic Bullet blades which sit shallowly in the blade base. The Master Prep has extremely highly-rated reviews, people love it. It’s more powerful than the Magic Bullet and it does offer stronger ice-crushing abilities. It is a bit more expensive, perhaps $15-20 more than the Magic Bullet. Take a look at both and see which one looks more preferable to you in terms of aesthetics and method of use. The Nutri Ninja Auto iQ is a bullet blender, like the Magic Bullet. However, it is more expensive (around $50 more depending on where and when). The Auto iQ is much more powerful, with 1000 watts. Another major difference is that the Auto iQ has manual buttons: start/stop, pulse, ultra blend and blend. The Magic Bullet has no buttons, it is operated by pressing down on the vessel. While the Auto iQ is great for smoothies and sauces, it’s not great for dry ingredients. The Magic Bullet can blend both dry and wet foods. Personally, I would go with the Nutri Ninja iQ because of the extra power and the option of auto programmed buttons as well as a pulse button. The Ultra Blend auto button is really great because it starts and stops on its own to create super smooth results. However, if you need your blender to grind coffee beans or chop nuts then go for the Magic Bullet as the Nutri Ninja Auto iQ isn’t made for dry foods. The Nutri Ninja Pro is similar to the Magic bullet in the sense that they are both manual bullet blenders. They are operated by pressing down on the vessel, without any buttons or auto functions. However, the Nutri Ninja Pro has 900 watts of power, as opposed to 250 watts. With the Nutri Ninja Pro, you get an 18 oz and a 24 oz cup. With the Magic Bullet, the cups are 12 oz and 18oz. The Nutri Ninja Pro is around $30 more expensive than the Magic Bullet, give or take, depending on where and when you purchase it. If you’re looking to make wet things such as smoothies, sauces and dressings then I would recommend the Nutri Ninja Pro over the Magic Bullet. It has more power and larger cups. However, it’s not made for dry ingredients such as coffee beans and nuts, so for that reason, the Magic Bullet is better for wet and dry purposes combined. You could say the Nutri Bullet 600 is the next step up from the Magic Bullet, in the same family. The NutriBullet is similar in the sense that it is a bullet blender with no buttons or manual functions, it works by being pressed down by the user. The NutriBullet 600 is more powerful, with 600 watts compared to the MB’s 250 watts. The NutriBullet 600 is around $20 more expensive, give or take. The NutriBullet 600 comes with two blades, a flat blade for dry ingredients and an emulsifying blade for smoothies. The NutriBullet 600 comes with 2 short cups and 1 tall cup which has a maximum capacity of 24oz, which is more than the maximum capacity offered by the Magic Bullet at 18oz. Again, I think if your needs are varied between wet foods such as smoothies and sauces, as well as dry grinding nuts and coffee, then go for the Magic Bullet. However, if you already have a grinder for dry foods then I’d go for the extra wattage and choose the NutriBullet 600. The Pro 900 is another step up from the Nutribullet 600, and two more steps up from the Magic Bullet. The Pro 900 has 900 watts, far more than the MB’s 250 watts. They’re similar in the sense that they are bullet blenders with motors, bullet cups, screw-in blades, and no buttons. The Magic Bullet comes with 12-oz and 18-oz cups, while the Pro 900 comes with 18, 24, and 32-oz cups. The blades differ slightly too; the Magic Bullet blade has 4 prongs, and the Pro 900 blade has 6. The Pro 900 is more expensive than the Magic Bullet. Because of the higher power, I would go for the Pro 900 as you’ll have better luck with hard ingredients such as frozen fruit. The Pro 900 cups are larger too. These two models are on opposite ends of the Bullet scale. The RX has a wattage of 1700, colossal compared to the Magic Bullet’s 250 watts. The RX has a heating function for heating soups and sauces as they blend. The RX has much larger vessels, 30 oz and 45 oz, (as well as a pitcher for heating soups). The largest vessel you get with the Magic Bullet is 18 oz. And of course, the RX is far more expensive. If you need a larger blender which can provide more servings, as well as a heating function for soups and sauces, then check out the RX. If you just need a decent personal blender for single-serve smoothies, grinding coffee, and whipping up a dip here and there, then the Magic Bullet would totally suffice. The Oster My Blend is made to be a sports blender, as opposed to an all-round, versatile bullet blender. It’s best suited to people who want to whip up a shake or smoothie in a pinch, and take it with them in the provided vessel/sports bottle. You’re not going to grind coffee or whip up dips or salsas with the Oster My Blend. However, the Oster My Blend does have more power than the Magic Bullet, clocking in at 400 watts. It’s great for shakes and smoothies where lots of ice is used. The Oster My Blend is cheaper than the Magic Bullet, but they’re both very affordable regardless. Go for the Oster My Blend if your sole intention is to make smoothies and shakes which you can take with you to work or the gym. If you need a more versatile blender to grind coffee and chop veggies for salsas etc, then the Magic Bullet would be better. Two totally different machines in all ways. The Magic Bullet is a small, cheap, personal blender with a max. capacity of 18 oz. The Vitamix 5300 is an expensive pitcher blender with a max. capacity of 64 oz. The Vitamix has a 10-speed dial and a pulse switch. The Magic Bullet has one speed, and is activated by pressing down on the cup. The Vitamix 5300 is far more expensive than the Magic Bullet (around $300 more). The Vitamix 5300 has 1380 watts, the Magic Bullet has 250. You could have both. The Vitamix 5300 would work for you if you’re in need of a new pitcher blender to sit on the counter to make smoothies, shakes, dough, ice desserts, soups etc. You could have the Magic Bullet stashed in the cupboard for grinding coffee, making smaller batches of dips and salsas, or even whipping up a single-serve smoothie with an easier clean-up. The Magic Bullet website sells accessory packs so you can stock up on extra cups, blades and lids. They also sell replacement power bases and different kinds of blades such as the ice crushing blade, flat blade and cross blade. What’s The Best Price For The Magic Bullet and where can I buy it? I’d keep an eye on Walmart and Amazon, they have the best prices for the Magic Bullet as of now. But because sales and specials come and go, take a quick look across all retailers before you buy as you might find a better bargain at the time. Although there are thousands of people who love their Magic Bullet enough to give it 5 stars, I have to say that it wouldn’t be my first choice. With all of the other bullet blenders out there with more power, stronger blade mechanisms, more accessories and programs…I would be swayed against the Magic Bullet. Something like the Pro 900 or even a NutriNinja iQ would be a better choice as you get higher capacity and more power.